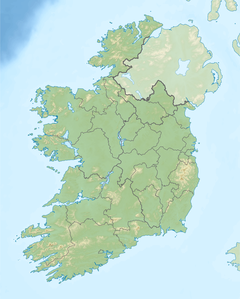 Brassel Mountain (Irish: Cnoc Breasail, meaning "hill of the raddle")[a] at 575 metres (1,886 ft), is the 261-st highest peak in Ireland, on the Arderin scale. It is part of the MacGillycuddy's Reeks range in County Kerry. Brassel Mountain is the south-east spur of the larger neighbouring peaks, Cnoc an Chuillinn 958 metres (3,143 ft), and Cnoc an Chuillinn East Top 926 metres (3,038 ft). Because of its positioning away from the main ridge of the Reeks, and away from the glens used to access the Reeks (e.g. the Hag's Glen), Brassel is less frequently climbed, but can be used as an exit, or entry point to the main ridge. ^ Paul Tempan notes in his Irish Hill and Mountain Names (2010), that the Irish Ordnance Survey Name Book suggests that Breasal is a man's name, but that a connection with raddle, the red-dye traditionally used to mark sheep, seems more likely. ^ a b Brassel Mountain at mountainviews.ie. Accessed on 7 Feb 2013. ^ a b Paul Tempan (February 2012). "Irish Hill and Mountain Names" (PDF). MountainViews.ie. ^ "Arderins: Irish mountains of 500+m with a prominence of 30m". MountainViews Online Database. October 2018. ^ Ryan, Jim (2006). Carrauntoohil and MacGillycuddy's Reeks: A Walking Guide to Ireland's Highest Mountains. Collins Press. ISBN 978-1905172337. ^ Dillion, Paddy (1993). The Mountains of Ireland: A Guide to Walking the Summits. Cicerone. ISBN 978-1852841102. Wikimedia Commons has media related to MacGillycuddy's Reeks. This page was last edited on 11 April 2019, at 11:52 (UTC).